This New Year’s Eve, experience the best party the Lower East Side has to offer at The Delancey. Known to host some of LES’s hottest parties, The Delancey offers partygoers a New Year’s Eve celebration jam-packed with entertainment and a vibrant atmosphere. For those looking for a night of mingling with New York City’s elite nightlife crowd, look no further. The Delancey’s New Year’s Eve party is destined to be unforgettable. Start your night by indulging in the five-hour premium open bar. Enjoy a night of non-stop music from a live DJ playing the hottest Top-40, hip-hop, and house hits. Hungry? We’ve got you covered with small bites. As midnight approaches, raise a glass of champagne and take part in a DJ-led countdown. Take your night up a notch with one of our VIP ticket options offering perks such as reserved seating and bottle service. There is no place like The Delancey: the three-level venue is known among trendy partygoers as a destination hotspot in Downtown New York City. The main floor is equipped with sleek wood tables, exposed brick wall, and intimate leather sofas. The rooftop offers a tropical feel with an abundance of greenery, a stunning fountain, and a jaw-dropping view of the Williamsburg Bridge. If you’re looking to jam out, head down to the basement and experience the Club, an upbeat space topped off with a full-service bar and DJ booth. 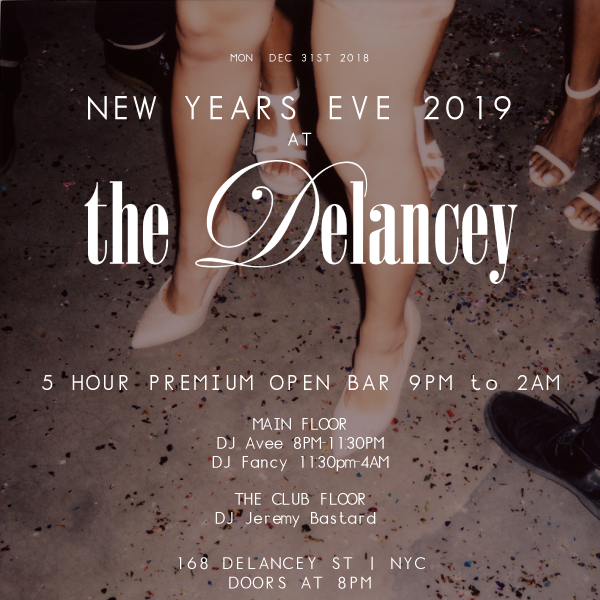 This New Year’s Eve, enjoy a party like no other at The Delancey.